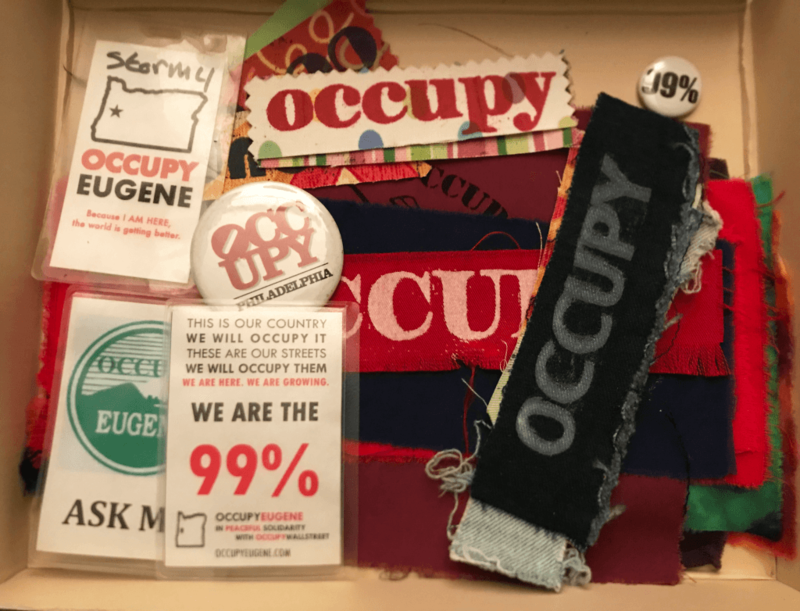 Special Collections and University Archives is pleased to announce a new finding aid published for the Occupy Eugene collection (Coll 484). The finding aid is now available on Archives West. The Occupy Eugene collection contains notes, agendas, contact lists, speeches, campaign plans, drafted proposals, reports, event lists, correspondence, photographs, DVDs, posters, handmade signs, fliers, handouts, clippings, newsletters, guides for protesting, chants, and documentation relating to other Occupy movements throughout the United States. The Occupy Eugene movement began in 2011 with the aim to invoke “accountability and responsibility in government.” In line with Occupy Wall Street, Occupy Eugene protested global banks and corporations arguing that these entities “embody the process that causes untold misery among 99% of the people for the benefit of top tenth of one percent with incomprehensible wealth.” The Eugene movement also supported a campaign to decriminalize homelessness. Protesters occupied local parks, including Millrace and Alton Baker.